Learn To Repair, Restore & Care For Automotive Leather Interiors. Automotive leather interiors require regular maintenance in order to retain suppleness and appearance. Without the right care, leather can become stained with accidental spillages, body oils, sun creams, sticky foods, mud, etc. Additionally, UV rays can cause the leather to become faded, to dry out and become cracked. Repeated entering and exiting the vehicle causes abrasion and wear on the seats and bolsters. Eventually, leather can become worn through or even ripped. 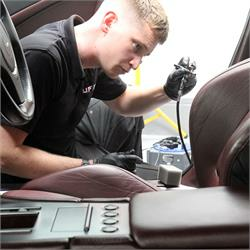 Fixing these problems is an integral part of the detailing process and requires specialist knowledge, techniques and tools. Hosted at UF Studio, Brands Hatch, and delivered by Ram Iyer, Colourlock UK Managing Director, the Colourlock Training & Certification Day is designed to give professionals a deeper understanding of the material, leather care and processes required to repair and re-colour faded interiors. In addition to safe cleaning protocols, participants will learn about the different types of automotive leather and how best to protect them from stains and UV damage. Participants will be taught how to assess damage, repair cracked or torn areas and restore faded, tired-looking leather seats and upholstery. At the end of the session, there will be the opportunity for participants to try their hand at colour mixing, matching dyes to upholstery. On completion of this course, participants will receive Colourlock Approved Certification and be able to advertise advanced leather care and repair as part of their detailing services. During the course of the day, delegates will develop an understanding for the different types of automotive leather and how that impacts on the care required. There will also be training in how to resolve difficult leather issues, with time for hands-on practice. At the end of the day delegates will finish with a colour-mixing competition before receiving Colourlock Accredited Training Certificates. Refreshments will be available throughout the day and lunch will be provided. Throughout the day there will be the opportunity for hands-on practice with an instructor in attendance to answer any queries. Lunch and refreshments will be provided. Please let us know in advance of any dietary restrictions, food allergies or cultural and religious preferences. The Colourlock training day was really useful. Customers often ask me for a leather repair or recolouring and up until now, I’ve had to pass on this work. After this training event I am now able to offer Leather Repair as part of my service. Ram was very approachable and highly knowledgeable. I came away with so much information – I never knew how much there is to know about leather! I would recommend this course to anyone looking to extend their range of services. There was so much involved in this one-day event, I’d like to do it again!